Since writing this post in which I questioned the way in which women were being denied access to midwifery-led units because they are perceived to be at higher risk, I have received a number of emails which all essentially ask the same thing: This is an issue in my area, too. What can I/we do about it? This post contains 30 ideas of things you can do, not just on this topic, and not even just in relation to change around childbirth but in relation to being politically active in almost any area. I’ve tried to include some direct ideas, and some tips about how to support yourself while you’re at it. As I’ve said below, not everyone likes – or needs – to be at the front, and these won’t all be relevant to every situation, but I hope everyone who has emailed me, and everyone else who reads this because they are trying to work out how to make a difference, finds something in here that will help. Become a member of AIMS or a similarly-minded group in your country, and support the voluntary and (genuinely) charitable organisations that are trying to make a difference. Find and support the local midwives, doctors, doulas or birth folk who are trying to make a difference, too. Perhaps especially the midwives and doctors who seem to get it, because they’re the ones who will best understand which barriers need to be broken down. Volunteer to become a member of the local MSLC or a service user or ‘patient’ (sic) liaison committee. Talk to your local Head of Midwifery, Consultant Midwife or a supervisor of midwives and ask how you can get involved and/or what you can do to support existing efforts towards making positive change. If you don’t get any joy from #4, keep talking to other people until you find someone who seems to be on the same page as you and/or understands the problem. Make sure you do understand the problem by reading everything you can, so that you become as informed as possible about the issues you care about. Make sure you are informed about the social, historical, economic, cultural and political elements of the situation, as an understanding of these makes it much easier to make change happen. Surround yourself with other people who are politically involved rather than those who don’t care. You’ll get energy from being with them, as opposed to finding yourself expending energy arguing with those who may not understand your passion or, worse, may belittle your efforts. Set up, promote and attend positively-focused events which highlight what women are wanting and let services know about them. Create bumper stickers or posters that get your message across. If you’re asking this because your own needs weren’t met, consider writing, complaining or taking action. If you’re asking this because you know other women or families whose needs weren’t met, consider encouraging and supporting them to write, complain or take action. Create, join and run groups whose purpose is to support AND seek change. Figure out what your skills are, whether you work best in large or small groups or by yourself and play to your strengths. We don’t all need to be shouting from the front lines to make a difference. Think about what skills you have from your previous educational / life / work / parenting / relationship experience, and consider what you can offer to a group from your skill set. You’ve already got more useful and transferable skills than you probably realise. Write letters to newspapers, or consider writing open letters and put them online as well as sending them to the relevant people or service. Remember also to write to people who have done well or supported you, and thank them. Those people may be feeling really alone in the system, and it’s actually really important to do what we can to help them keep going. Start petitions, or write letters to local decision-makers and have them signed by lots of people. I know one instance where a ‘we feel you didn’t give us what we expected’ letter which was sent to a manager and signed by tens of service users actually got the manager’s attention and inspired real change. 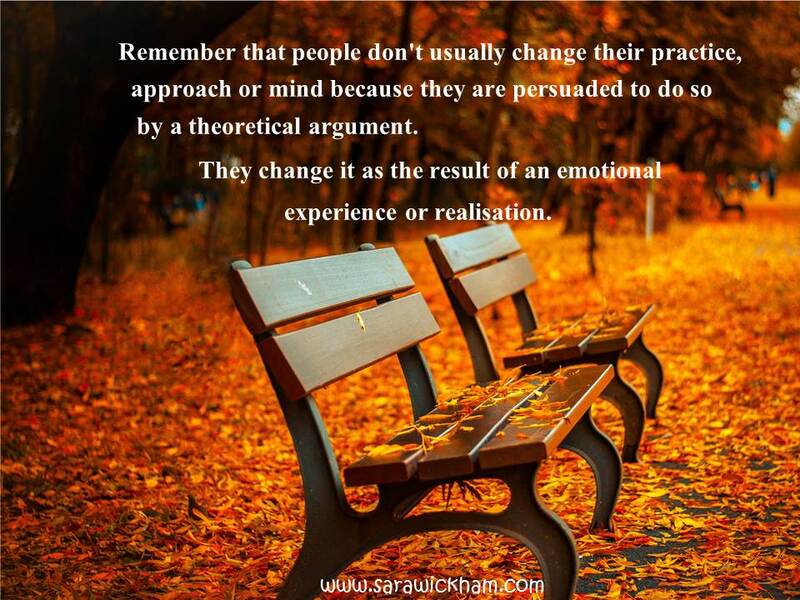 Remember that people don’t usually change their practice or approach because they are persuaded to do so by a theoretical argument. They change it as the result of an emotional experience or realisation. If you’re outside the UK and ‘Am I Allowed‘ doesn’t provide everything you need, become an expert in what women’s rights actually are in your part of the world, and find ways of sharing this information with women. Ask other people what they recommend you read. As you read, start a recommended reading list for others. Make leaflets or information sheets to let other people know what their rights and options are. Try and understand why other groups (e.g. those who make the policies that you don’t appreciate) are doing this, and what is motivating it. It might not make you feel better, but understanding it might help you work out how to approach it when seeking change. Join other local people’s related campaigns and causes (as long as they’re not in conflict with your own, of course) … it’ll help you learn about what works, and you’ll meet more people who care enough to protest or challenge, and who may in the future join yours. Support other groups and individuals who share your goal (for example by offering help, buying their services, donating to their cause, sending thank you letters or just letting others know about them). Boycott companies and organisations whose goals or products or standpoints or ways of operating are unethical or counter to what you care about, and encourage others to do the same. Use social media not to share gossip but to spread messages that you think are important.